Mastering the basics is key to any good golf swing and building all important proper muscle memory. 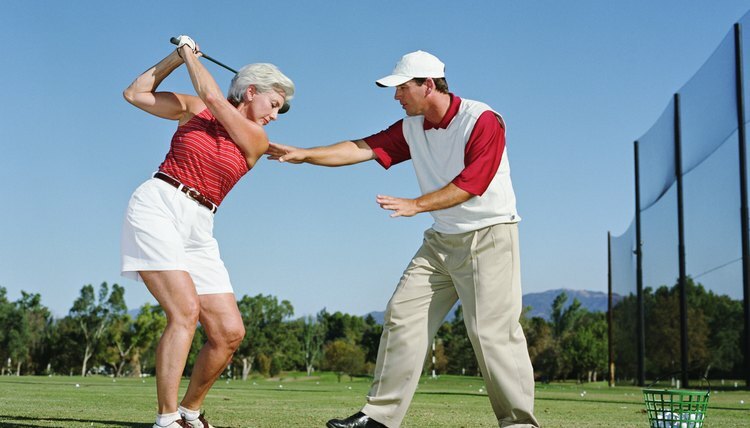 Understanding the proper golf swing is essential to playing well and scoring low. But before any tweaking can be done for improvement, the basics must be mastered, from how the player addresses the ball to how the player follows through on the swing. Each step is important to get that smooth swing so many golfers are after. Address the ball properly by standing with the legs shoulder-with apart and with a slight bend to the knees. The clubhead should rest on the ground and tilt so the shaft is resting in the hands with the arms hanging down in front of the body loosely. Ball position depends on the type of club and shot desired; the ball is even with the front foot when using the driver; it is in the middle of the stance for most other shots. Move the clubhead back and upward in the backswing. The arms should remain away from the body, and as the club goes back, the back elbow and the front knee should bend slightly. The backswing should finish with the club either pointing toward the intended target when using the driver or more up in the air if hitting an iron. Swing the club forward by first twisting the hips toward the target and then bringing the arms through. The wrists should stay strong and even roll over when contact is made, with the back wrist finishing slightly more toward the target than the front wrist. The arms should return to their original position when contact is made, with both arms straight down. Focus on the ball as contact is made, and the arms and body come through the swing. Your head will begin to rise naturally as it makes contact with the back shoulder and the swing nears completion. Bring the club all the way through the swing, with the club finishing over the front shoulder. The upper body should be twisted to be square with the target, with the front leg in the starting position. The knee of the back leg should be bent, with just a toe on the ground.